A new version of the Golden Machin Horizon label is reported in use today (23 August) at Old Street PO in London. The new label now received - appears to have the same security cuts, but is without die-cut 'perforations'. 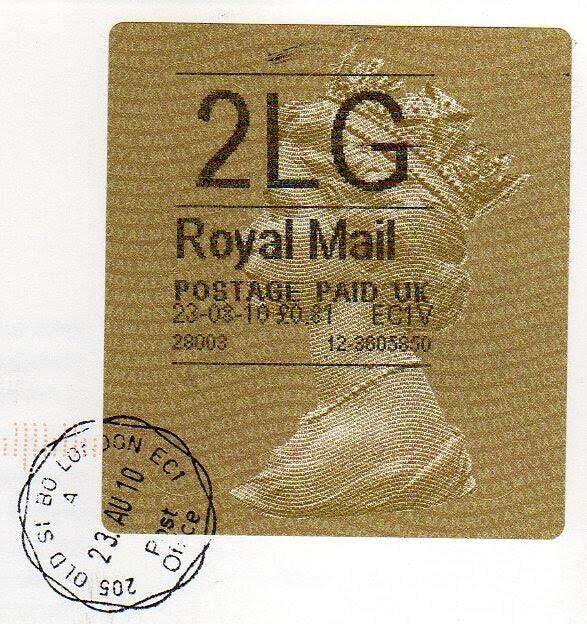 The 'ROYAL MAIL' security overlay seems to be the same, suggesting that De La Rue have used the same printing plates and simply changed the cutter from 'perforations' to straight line with rounded corners. There have been many reports of post office counters experiencing difficulties in feeding the sheet (of two labels) into the printer to use the second label, due to the 'teeth' left behind on the matrix being lifted when the first label is removed after printing. Those of us who were at London 2010 noticed that actually peeling the first 'stamp' from the backing paper was not as easy as removing the white labels. I understand that the covers produced especially to mark the first day (numbering only about 60) all had the Old Street cds applied to the label. 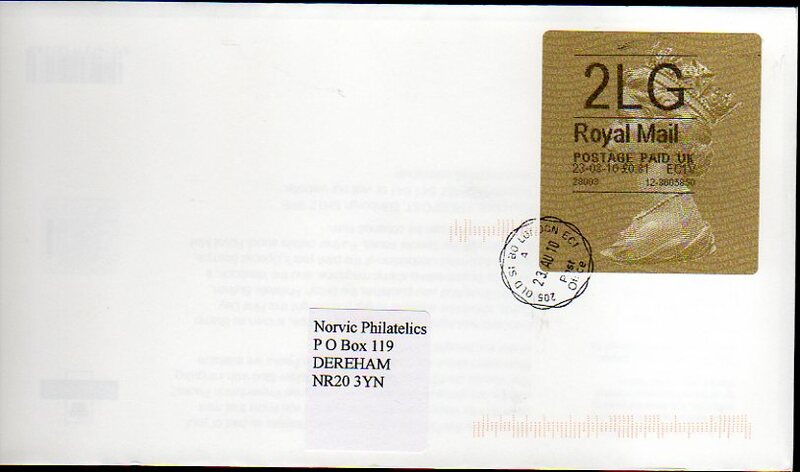 Mail from other customers was probably processed normally without the datestamp. I'm told that these new labels will be used in Chesterfield PO later this week, and will be distributed to all POs during September. Some, of course, are still using white labels. I don't know if the 'perforated' labels will be withdrawn or used to exhaustion, but if current experience is anything to go by, we can expect to find some 'half-sheets' discarded at PO counters. Re FDCs: Will past customers and others interested who have not already done so please contact me as soon as possible if you are interested in the latest First Day Cover. Those who have already made contact - I'll write again soon! And if anybody has 23 August mail from Old Street I would be interested in having examples, or at least pictures.